Thanks to Gilt City for an awesome week!! The turn out last Wednesday was overwhelming - much Burger Love to the gang at Gilt...they really know how to put together an event with class. If you like Good Stuff, you will Love Gilt City - go sign up now! You Burger aficionados loved last week's new addition - The Bymark. 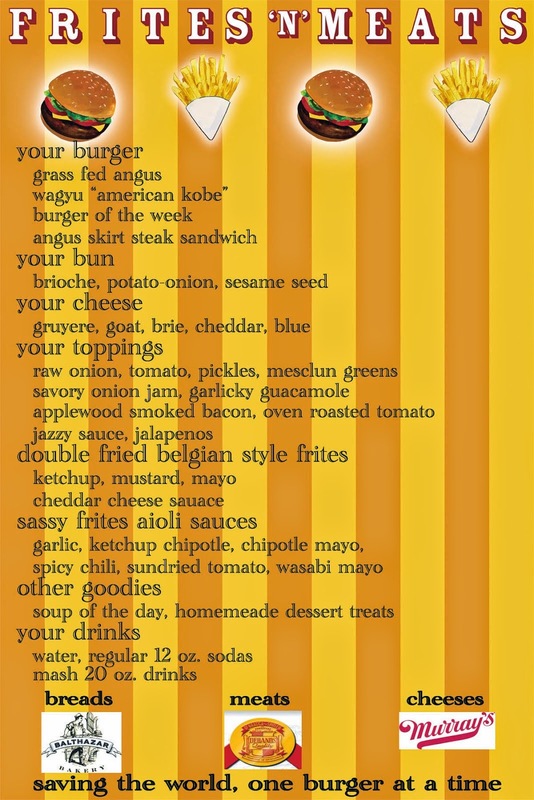 Your enthusiasm has inspired us to create a new addition to the Burger of the Week lineup - The Spicy Jazz. The Spicy Jazz is filled with lively ingredients that will light your mouth on fire! Here's to a great week!! We have a brand new addition to the Burger of the Week - you guys are going to absolutely love it - 'The Bymark' - Seasoned Grassfed Angus Patty with Brie, sliced grilled mushrooms, Garlicky Lemon Aioli on a Brioche Bun.....oooh, I am salivating right now! Go get yours! As if last week wasn't fun enough...thanks to Charles Oakley and all his fans and the Frites'N'Meats fans - Thanks all for your support! This week we have a very special event for NYC Gilt (twitter.com/GiltCityNYC) members on Wed, 10/27 at our lunch location. It is a great opportunity for you guys to get a special members only deal....and if you are not a member - this will be a great opportunity to become one - just sign up on the spot! We even have a very special Burger just for Gilt members - you have to show and taste it to believe it. We had a great time with Charles Oakley today on the Burger Palace. We had an amazing turn out today and people were chanting Charles Oakley and Frites 'N' Meats. Everyone loved his World Famous Turkey Burger so much we will keep it on the menu for the remainder of the week. Thanks No. 34 with much Burger Love!! No. 34 - Charles Oakley!!! Yes folks....if you have been following our tweets, you heard right!! The man himself, Charles Oakley will be joining us for lunch today (Water & Broad) serving up his World Famous Turkey Burgers! There is only a limited number so come and get 'em!! This week will be super exciting! First, we will be bringing the Burger Palace to our friends at ARS NOVA to kick off SHOWGASM!! To cap the week off, we will be preparing some special Burgers for folks at Maker's Mark....marinated in guess what.....the BEST BOURBON in the world!!! Can we get any more spoiled then this?? Frites'N'Meats Burgers with a touch of Maker's Mark - Out of this World. Seasoned Grassfed Angus Patty, Gruyere & Cheddar Cheese, Savory Onion Jam & Homemade Sassy Slaw. The more things change, the more they stay the same. This is a timeless saying and holds true for us more now than ever before. A year ago, Alex & I started Frites'N'Meats with the desire to bring some of the best Burgers & Frites to the streets of NYC. Over this past year, this has been our singular pursuit. From the beginning we were very fortunate to find a couple of guys, Al & Moody, who shared this goal with us and were instrumental to realizing this vision. In fact, in many ways, they were probably more instrumental to this than we were. After all they are the guys on the truck every day making the Burger & Frites, the Sassy Sauces, the ones talking to you and making sure that not only are the Burgers & Frites top notch but that your overall experience is top notch as well. We saw their passion for the business and their desire, and now we all decided it was time to turn Frites'N'Meats over to them. We will still continue to advise and, where needed, guide them, but the baby we saw through its infancy is now theirs to grow into adulthood. We are certain that they are the best stewards we could havee found for our child and are confident that they will do us all proud. We thank you for a wonderful first year and know you will continue to support Al & Moody as they take Frites'N'Meats to the next level.